The Methodist Hospital System, the renowned Texas-based healthcare center, recently changed its name to Houston Methodist. The campus includes a 500,000-square-foot research institute in addition to five hospitals with a total of more than 1600 beds, and is a center for medical discovery and teaching as well as world-class patient care. So, while its name has changed, its well-earned slogan, “Leading Medicine,” remains the same. 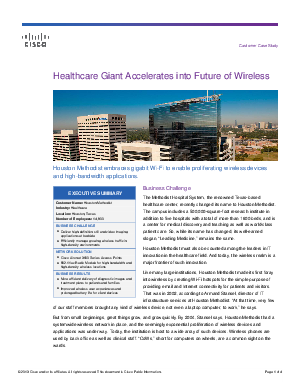 Houston Methodist must also be counted among the leaders in IT innovation in the healthcare field. And today, the wireless realm is a major frontier of such innovation.